This beautifully constructed trawler must be seen! 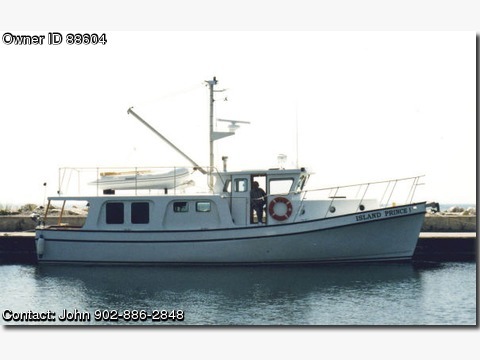 Many trawler purists refer to this hull as a New England Lobster or Down East style trawler. This hull was designed initially for heavy industrial work and by most standards is "over built" for the duty of a traditional cruising style vessel. A few of these customized trawlers are now cruising the waters with 250 more in commercial fishing. Entry into the salon is through a glass door with large sofa settee port and starboard aft. This is a "galley up" model with sink a stove to the port side of salon. A lower pilot house with an amazing view is up front with helm seats. Two steps down to the forward stateroom has full a walk-in head and Avonite sink to starboard side. Access to the port side has full walk-in large shower stall with Avonite sink, hanging clothes locker. The forward stateroom has center line double berth with a small bench seat in each corner. The custom wood interior is absolutely stunning and the surrounding windows allow for a bright and airy salon. There are very few cruising vessels that could compare to Island Prince. She is ready and waiting for her next set of adventures with her new Additional Specs, Equipment and Information: Specs Builder: Provincial Designer: Provincial Dimensions LOA: 42' Beam: 13' 0" Maximum Draft: 3' 10" Displacement: 22000 pounds Bridge Clearance: 12 ft. & 22 ft.